The higher education landscape today is littered with colleges that failed to understand the trends, failed to innovate and took their focus off their core values. Late last month I challenged our administrators to reflect on the College’s values, which begin with “We value our students, employees and the community members we serve by making decisions that address the needs of those populations.” Our values also cover integrity, excellence, communication, collaboration and open admissions and access. If Pima Community College is going to reach its potential to be a premier community college, each of us must be committed to our organizational values and to fulfilling our mission. The challenge, of course, is that today’s world is much different than when Pima opened its doors nearly 50 years ago. Today’s technology-driven, global economy demands innovation at an unprecedented pace. Further, our students must be prepared for a world that moves seamlessly across borders, thanks largely to technology, and a workforce that integrates ideas and cultures from every perspective. To put students first at Pima Community College means exposing them to cultural opportunities and providing a global understanding. Even graduates who will build their lives and careers in Pima County must be prepared for a workforce where the company owner is from China or Germany or elsewhere; where the expectation is to be multi-lingual or culturally competent; where the workplace enjoys a rich diversity. Our students return from study abroad opportunities to China, Ireland and other places they might have never thought possible as changed individuals with a new confidence. 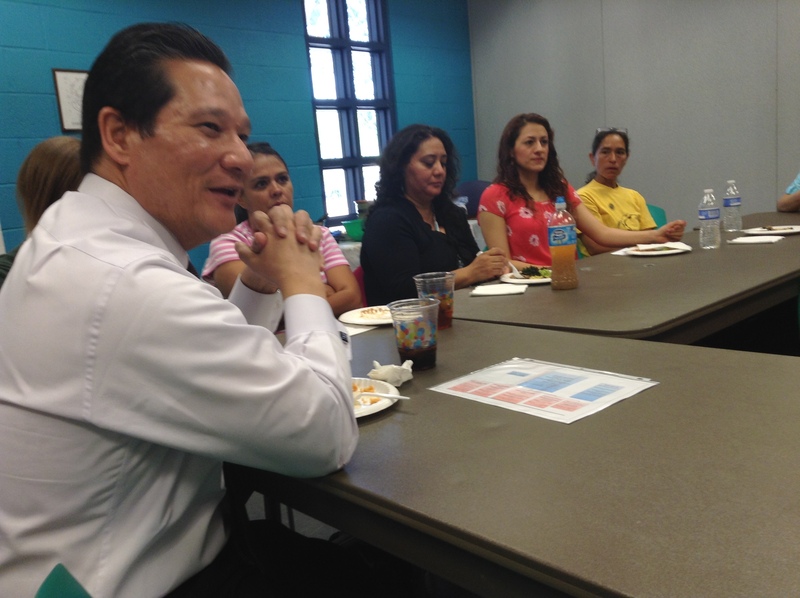 Pima students study alongside our international students, break bread with them, learn from them. Everyone benefits. Putting students first at Pima means innovating to ensure they have access to the best services, the latest teaching methods and the newest technology. STEM fields are changing rapidly and Pima must adapt to ensure that our students are prepared for those great jobs. If our programs aren’t innovating, they are dying. Recently we were told that everything about college should be easy, except for the learning. Putting students first at Pima also means innovating our student experience, providing welcoming, encouraging and effective interactions. Finally, putting students first means that faculty, staff and administrators can’t wait for opportunity before they act. They can’t wait to be asked. They can’t wait for crisis to compel change. They can’t hope difficult times will simply pass by. Each of us owes it to our students to live our values, to watch and understand the trends, to innovate to meet student needs. The day is gone when good enough was enough. “Good enough” is not in Pima’s lexicon. I shared the story of James Dyson and how a local sawmill inspired his line of vacuum cleaners. For James Dyson, good enough was not an option and he found inspiration for something better, perhaps even the best vacuum cleaner. I challenge Pima supporters and employees to find your inspiration. Get excited when you think that Pima Community College can be a premier community college, with record-setting completion rates, multiple nationally recognized programs and standard-setting customer service. We are certainly paving the way for that with guided pathways, Centers of Excellence, iBEST and other initiatives. We will continue that very good work and keep building on it. Think about how you would answer “what have I done to fulfill the College’s mission? How I have lived the College values?” If you don’t like your answer, know that you can aspire to more. This entry was posted in Uncategorized and tagged Centers of Excellence, globalization, IBEST, Innovation, mission, premier community college, STEM, Study abroad, technology, Values on June 7, 2018 by pimachancellor. I was privileged to attend the beginning of a new era at the College recently. I was among about 50 students, educators and community leaders, including U.S. Rep. Raúl Grijalva, for the announcement that Pima Community College Adult Education has become Adult Basic Education for College and Career (ABECC). As Dean of Adult Education Regina Suitt said during the announcement ceremony, Adult Education’s focus on student success remains unchanged. Pima’s Adult Basic Education division will continue to be the county’s No. 1 provider of Adult Basic Education, High School Equivalency (HSE) preparation, GED testing, instruction for adults learning English and job skills training. The new name reflects the opportunities for adult learners to use an HSE as a launchpad to transition to vocational training or further academic achievement. With 88,000 adults in Pima County lacking an HSE, the need is great. Regina highlighted the story of Linda Langston, who is benefiting from the College’s development of diverse academic pathways that extend beyond an HSE. Linda has completed our Integrated Basic Education and Skills Training (IBEST) and received a Behavioral Health Services certificate. IBEST is a nationally recognized instructional model that boosts students’ basic skills while they attend an occupational program. In the BHS/IBEST program, basic reading, writing, and math skills are contextualized into the BHS course content, with ABE and BHS instructors co-teaching the program. Linda earned a 4.0 GPA in her program and recently won an Arizona Association for Life Long Learning, Adult Literacy Week contest. “Pima removed so many roadblocks for me,” she said, adding that she intends to pursue employment in social work. Student Dominique Lewis and May 2015 graduate Israel Gonzalez Jr. echoed Linda’s story of transformation through education. Rep. Grijalva put ABECC’s intensified focus into eloquent perspective. As our economy responds to the employment demands of a new age, integrated education programs become essential for our students, he said. Regina and her team of staff and instructors within Adult Basic Education for College & Career are meeting the demands of the 21st century workplace. I thank them for their work to serve our students and community. This entry was posted in Uncategorized and tagged Adult Basic Education, Adult Education, GED, High School Equivalency, IBEST, Regina Suitt, Rep. Raul Grijalva on February 22, 2016 by pimachancellor. Two topics central to the College – how Pima Community College can prepare students for careers, and how educators assess learning – came up in an interesting conversation during my visit last week to the El Rio Learning Center. The Adult Education students who took part in forums and discussions with staff and faculty come from diverse backgrounds. All are on the road to a high school equivalency, but are setting their sights on the next steps of their education journey. I told them the College has to provide students with more on-ramps to a career or a profession, such as internships and apprenticeships. A promising example for Adult Education students is the Integrated Basic Education and Skills Training program. IBEST is a nationally recognized model that improves stu­dents’ literacy and work skills so that they can earn credentials and get middle-class jobs. In an IBEST classroom, two instructors — one teaching professional content that students will need in the real world of work, the other teaching basic skills — work together so students can move through school and into jobs faster. Northwest Campus is de­veloping an IBEST component for its Hotel and Restaurant Management program; students in the program receive contextualized Adult Education, but a high equivalency is not the endpoint; the ultimate goal is employment in a growing industry that offers the opportunity to work all over the world. One El Rio instructor spoke of students who make huge gains in learning that do not translate into improved scores on high school equivalency tests. Assessing student learning is a struggle for higher education, which relies too much on examinations that often aren’t sufficiently sensitive gauges of progress. The jobs of the 21st century require so-called soft skills – communication, problem solving, teamwork – whose mastery is difficult to reduce to a single number on an exam. Portfolios of work and capstone projects are more sophisticated measures of learning that account for differences in learning styles while still satisfying the need for assessment. At El Rio, I asked the students, “What is your North Star?” In other words, what is your unwavering goal, your passion, the aspiration that other aspects of your life revolve around? Their answers indicated a deep desire to give back to the community. Putting students at the center of the learning process is essential to helping them reach their North Star, and to moving the College forward. This entry was posted in Uncategorized and tagged Adult Education, assessment, IBEST, learning styles on May 8, 2014 by pimachancellor.